bbPress is a plugin used to create a discussion forum on your WordPress-powered website. It is developed and maintained by some of the same people who help maintain WordPress itself. bbPress is a WordPress plugin that makes it easy to set up discussion forums right inside your WordPress-powered site. With a focus on ease of use, integration & simplicity, bbPress is quick to set up, and can be extended by way of the larger WordPress plugin ecosystem. and add more functionality as you need it. bbPress was born in late December 2004, coded from the ground up by Matt Mullenweg himself. Since then, Michael Adams joined the project, then Sam Bauers, and in 2010 John James Jacoby reinvented bbPress as a WordPress plugin. Today, the bbPress plugin is alive and well, receiving a few updates each year, and occasionally adding new features. In order to use bbPress to create an online forum, you must be using a self-hosted version of WordPress. Further use of bbPress requires an in-depth guide, but I will briefly talk about customization next. bbPress plugins will add extra functionality to your discussion forum, while themes will control the design & layout of your forum. There are over 200 free bbPress plugins created by the WordPress community. All of these are free to use, but come with limited support. You can also find premium bbPress plugins to take your forums to the next level. If you are having trouble finding what you’re looking for, you can always create your own bbPress plugin. This page has a few resources to help you get started. 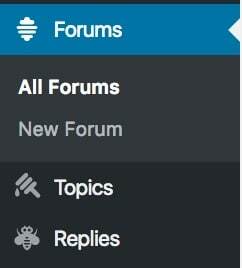 Themes allow you to customize every aspect of the design & layout of your discussion forums. As of December 2017, there are about 80 themes that claim to fully support bbPress. There are even more themes out there by third-party developers. If you can’t find a bbPress theme you’re happy with, you can always create your own or customize an existing one. More information is available on the customizing bbPress page. I hope that gave you a general overview of what bbPress is, and the basics of how to get started with a WordPress discussion forum. In the future, we’ll provide additional resources on how to create new topics, manage replies, register new users, and more.